From frontline roles to specialist squads, today women are eligible to apply for any role in Tasmania Police. “There are no positions a woman cannot apply for in Tasmania Police,” Inspector Jo Stolp, the officer in charge of People Support, said. “Even in relation to the Special Operations Group, it’s just a matter of passing the required components, the same as it is for male officers,” Inspector Stolp said. Tasmania Police has come a long way in the 100 years that women have been a part of the service. Today, women police officers have equal pay, equal conditions and equal opportunity of employment. Both men and women need to successfully pass a background check, fitness and suitability tests, group assessments and medical tests. To become a police officer, both men and women must complete a 29-week training phase, then they are deployed as a General Duties Police Officer to a training station at either Hobart, Launceston, Devonport or Burnie. The majority of Tasmania Police members work as general duties police officers statewide since these roles offer the greatest variety of duties. However, there are also other roles that require further and sometimes ongoing training and usually at least two years’ general duties operational experience as a prerequisite. Women can apply for any of these specialist roles, provided they pass the necessary physical, academic and suitability tests. 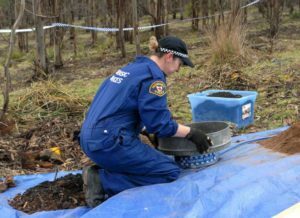 Above: Constable Michelle Rybarczyk was pregnant when she participated in a national forensics exercise in 2016. This page -- https://www.police.tas.gov.au/about-us/100-years-women-policing-tasmania-police/women-specialist-roles/equal-opportunity/ -- was last published on February 13, 2018 by the Department of Police, Fire and Emergency Management.